I do all my work in a Hawaiian straw skirt and bow tie of some neutral shade--I can often think of nothing to do but pile the books which are on one end of my desk very neatly on the other end and then kick them one by one off to the floor with my free foot. 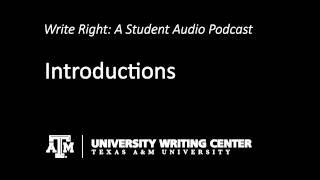 MEGHAN: Howdy Ags and welcome to “Write Right.” I’m Meghan Wall, and this is the University Writing Center’s student podcast. Today’s episode deals with writing introductions. Does this sound like you? KRISTI: Well I’ve chosen my topic and written this great thesis statement but I have no idea how to tie it all together. MEGHAN: How about this? Is it difficult for you to introduce a paper without diluting it with clichés or drowning it in wordiness? Do you start every paper with, ‘In today’s modern world’ or ‘Since the dawn of time’? Well if you are crying a river because you can’t seem to build a bridge to your thesis statement listen up, let me throw you a lifeline, with a few tips you can learn how to define, design, and decide what will be the most effective introduction to that never-ending paper. If you want to build a bridge, you need an anchor on two sides, even though your introduction is the first thing your reader encounters, it should not be the first thing you write. Know your thesis and draft the body of your paper first. You’ll find it easier to use the introduction to lead the reader into the deep seas of your argument if you know what that argument is going to be. SHAKESPEARE: [MAGICAL MUSIC] “Once upon a time, I had writer’s block.” Beginning your essay with a short anecdote creates a more personal tone when writing about a topic that has special meaning to you. But make it too long, and you’ll lose your audience’s attention. XAKEMA: Beginning with a question that has no specific answer makes the audience think, and, in turn, introduces your topic. But beware—you want your question to direct your audience toward your topic, not distract them. MANDY: Establishing a definition at the beginning of your paper explains the concept you may be trying to address. Be careful—anyone can use a dictionary. And there’s nothing more cliché and boring than Webster defines, insert your topic, as… Use a creative definition that initiates thought and addresses your topic. KRISTI: Who cares what your neighbor Bubba said about the effects of global warming on marine life? XAKEMA: I beg to differ… [COW MOOING] Starting your essay with a different perspective gives you the opportunity to argue your point, while still appearing conscious and knowledgeable of the opposition’s argument. Look out—you do not want your introduction to confuse the reader. Make your viewpoint obvious and appealing. MEGHAN: Deciding what’s appropriate for your topic, audience, and paper type is crucial in determining how to begin your paper. MANDY: What is the goal or topic of your paper? If you are describing nuclear fission, do not bomb your paper by starting with a narrative. KRISTI: In 1919 Ernest Rutherford became the first person to deliberately split the atom by bombarding nitrogen. MANDY: On the other hand, if you are in a creative writing class, you may have the option of using any one of the five types. Or come up with your own! There is a sea of choices out there. You can also begin with start with unusual facts and figures, a description, setting the scene or with a dramatic incident. MEGHAN: Who is the intended audience of your paper? MANDY: If you are writing a paper for Accounting 320, perhaps your audience is a potential client who has to be eased into understanding a financial statement, but if you are writing for agricultural economics the paper might be to economists who already know a lot of the background of your topic. MEGHAN: Think of your writing task like an advertising problem, the purpose of advertising is to sell a product. Advertisers seek the audience who is most likely to purchase a product. Once they have identified this group the “target audience,” they can write their ads to capture the attention of this audience. Hence, their purpose, which is to sell a product or service, shapes what they write. What type of paper are you writing? Persuasive? Informative? Narrative? MANDY: If you are writing a style analysis, a long introduction may take away from the bulk of the paper. But if you’re writing a persuasive paper, you want to begin with a solid introduction that captures the audience’s attention and contributes to your overall purpose. MEGHAN: Speechless? Don’t be. Cry me a river, build me a bridge, and get over it, your essay, that is. Today’s episode was the work of talented student and former member of the UWC staff Mary-Beth Schaefer. For more information on introduction writing and the Texas A&M University Writing Center please visit us online at www.writingcenter.tamu.edu. And as always we encourage you to stop by the writing center here on the 2nd floor of Evans library if you have a question about your introduction or for any of your other writing needs. I’m Meghan Wall hoping you’ll tune in next time for another exciting episode of Write Right!